Off to London we go ! 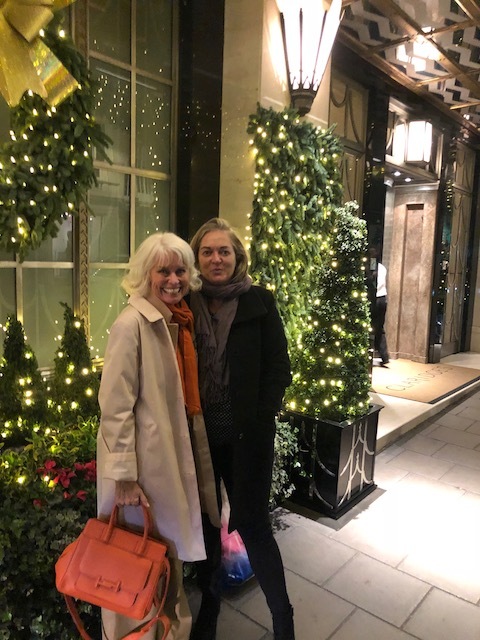 So off to London we go – but not always as according to the best laid plans ! 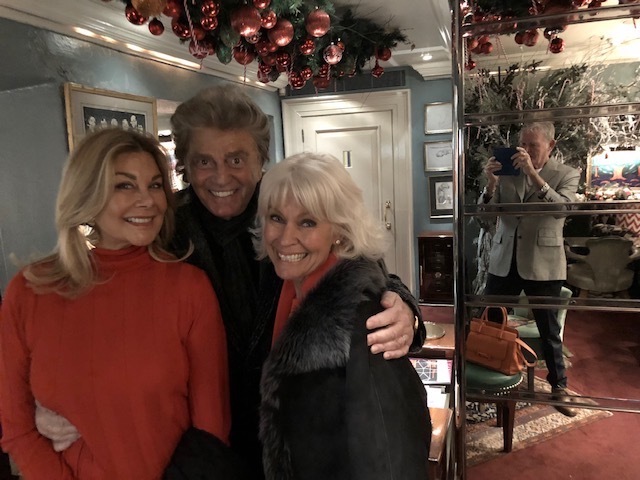 We were due to fly to Philadelphia from Nassau – and then on to London – but bad weather kept on delaying our flight until I saw the latest one and said to Bob that we would miss our connection. The next minute came notification that our flight from Nassau was cancelled – oh no ….. There was no-one around at our gate from American Airlines so we quickly went to the first desk we saw with an AA representative. And she turned out to be our guardian angel … her name is Eureinua Reckley and if anyone out there knows her from Nassau please tell her I am writing about her. Within 10 minutes she has us totally re-routed through Miami and then on to London. Waving our bags goodbye in Nassau – see you in London !! 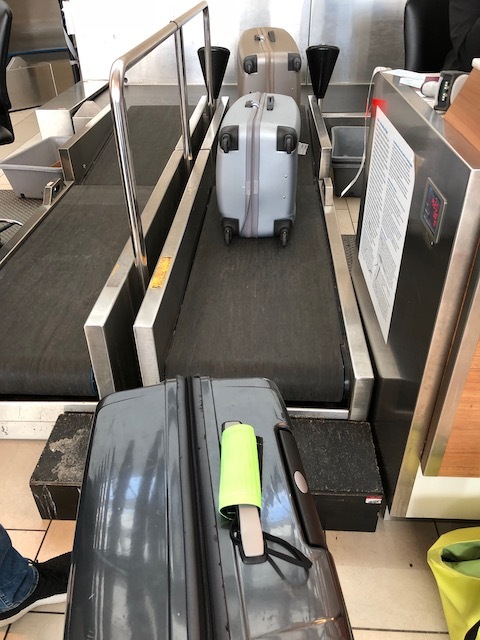 Within another 5 minutes we were on the plane to Miami – and she had contacted the baggage department and located our bags and assured they had been loaded and we would see them when we landed in London. And we did ! This woman was a miracle worker – she went the extra mile to get us sorted out – no fuss, no nonsense – just amazing efficiency and capability and a can do attitude. How rare it is these days to come across someone who really cares and goes out of their way to make things happen. So of course I wrote to the AA Customer Service to praise this wonder woman and got a lovely reply in return. 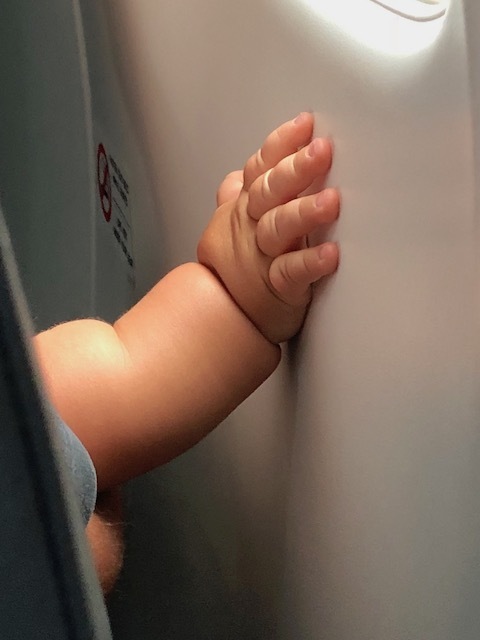 I couldn’t resist a picture of this gorgeous chubby toddler’s hand on the row in front. 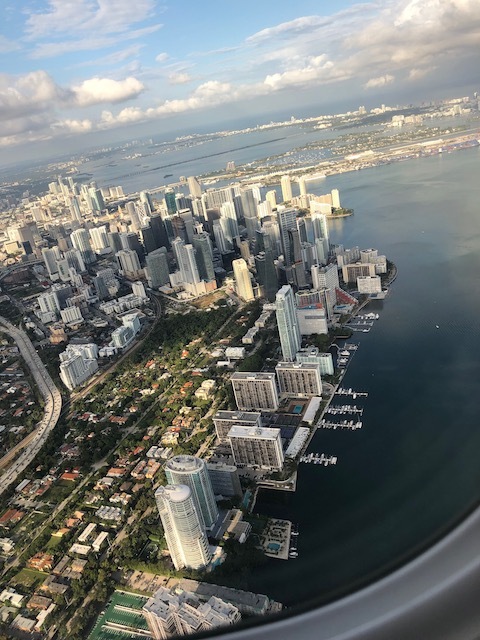 Coming in to Miami – not what we were expecting but a very welcome sight…. Once in London we had a treatment each from the miraculous Anastasia Achilleos – anti jet-lag and body clock reset. Just what you need after an overnight flight – and then we were ready to go ! 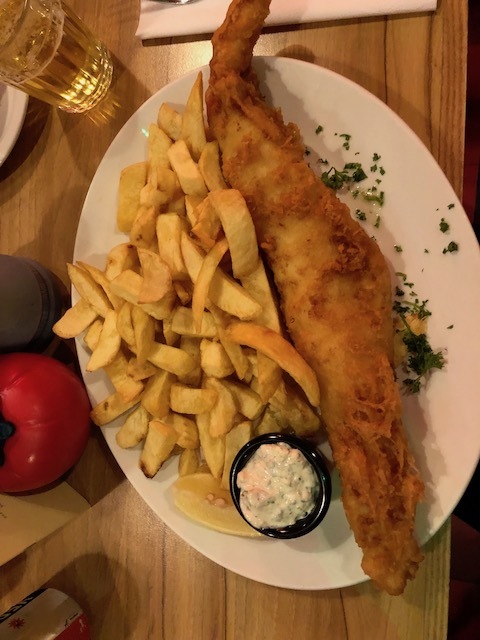 First meal was a plate of fish and chips – oh so good….. I can eat cold water fish – just no warm water fish. The cod in batter was exceptionally tasty at Golden Union Fish in Poland St Soho – I heartily recommend it if you ever find yourself in London. Oh I do love a plate of fish and chips …..
We spent a lovely time with Cassius, Bob’s youngest son and 3 of our grandchildren on Sunday – lots of hugs and kisses and a glorious Sunday lunch. The place we went to has a no phone and no photo policy – very refreshing after so many places where all you see are tables full of people with their heads down poring over their small screens. 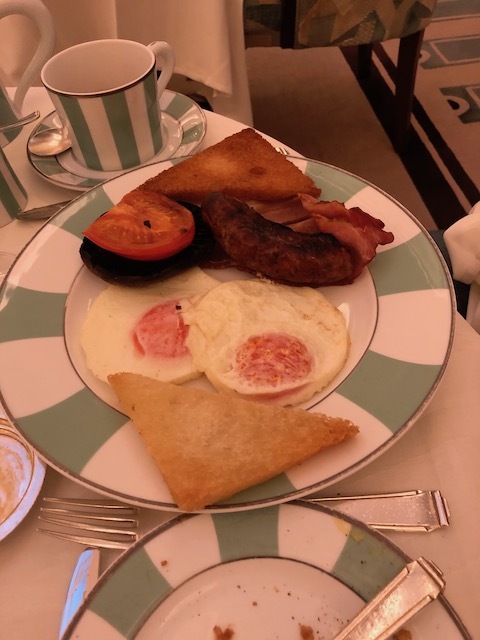 Bob’s breakfast in the hotel ! 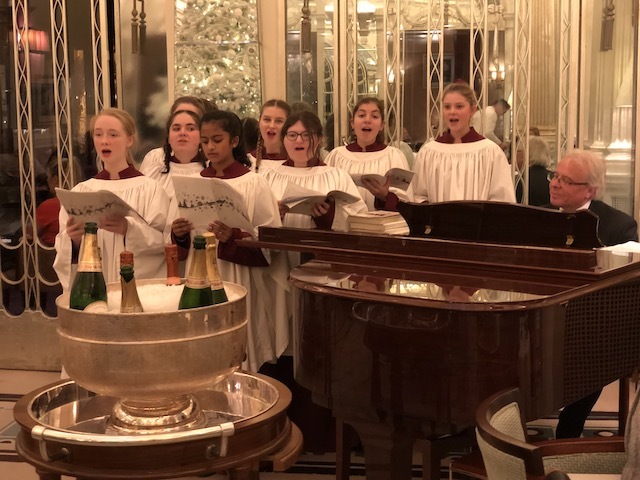 And Christmas carols being sung in the hotel on Sunday afternoon. 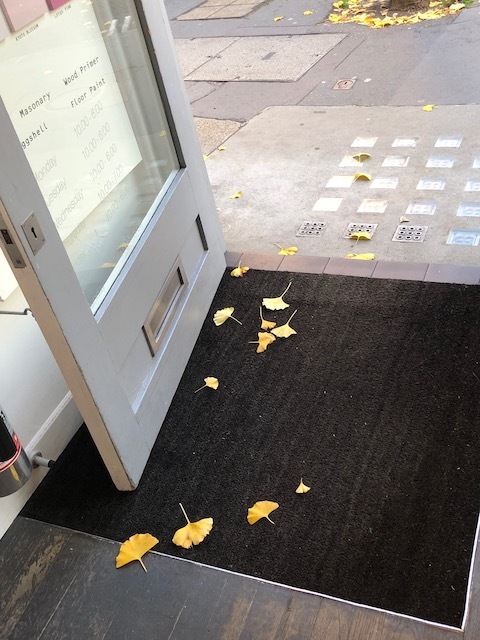 Marylebone High Street was a great spot for a little Christmas shopping – we wanted to get gifts for everybody we were seeing on Sunday and it was a delight. Plus we both got manicures and pedicures there as well. Sami and I and the Christmas lights….. The weather has turned very cold so it is time to wrap up warm before heading outside. A couple of visits to see movies and a LOT of eating have all been very enjoyable. 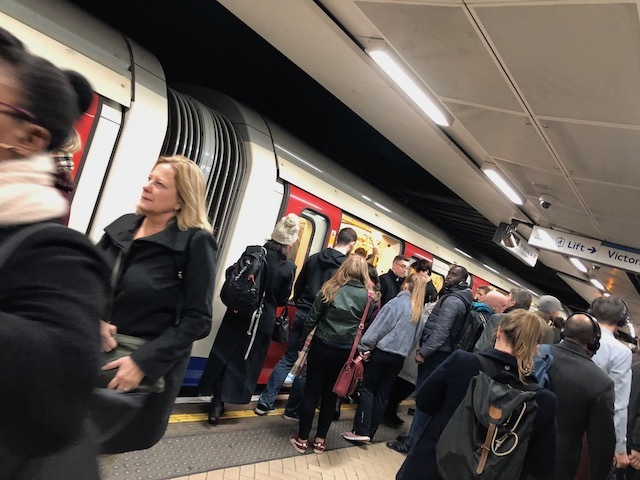 The tube in rush hour….. Happy Thanksgiving to you both. Your feast sounds delicious – we are off fo an Indian meal tonight. See you soon….. So sorry to hear about Norma. I really liked/appreciated her. Have you ever had the Yorkshire pudding at Rules? I know it’s a touristy place, but I find that pudding to be Kathy-esque. Safe and very happy travels………..
PS And a wheel of Stilton. Bobby will help conceal it.